Specialising in timber construction and representing one of the world’s top designers, Arch McTainsh, a former student at Westlawn School of Yacht Design, Connecticut, USA, has established himself as a designer of distinctive wide bodied planning launches with the attributes of an easily driven, sea kindly hull. Powerboats incorporating classic style and elegance with luxuriously appointed, spacious interiors. Nautic’s most successful design has been the Nautic 1560 Commercial, the design Rick Pollock chose for his new charter vessel MV Pursuit. Stock plans are available for this design and many others. Nautic specialise in custom, one-off designs; design ability not restricted to any type, style or size of vessel. 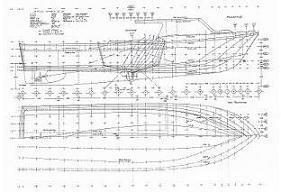 Boatbuilder enquiries welcome to manufacture Nautic designs on a one-off or production basis. 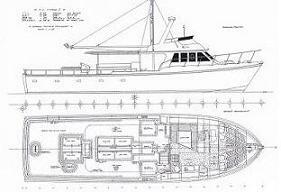 The latest on the drawing board are the Nautic 70ft, 98ft and 100ft Long Range Sportfishers. Lines lifted from existing vessels for survey requirements. Copyright © 2017 Nautic Marine. All rights reserved.